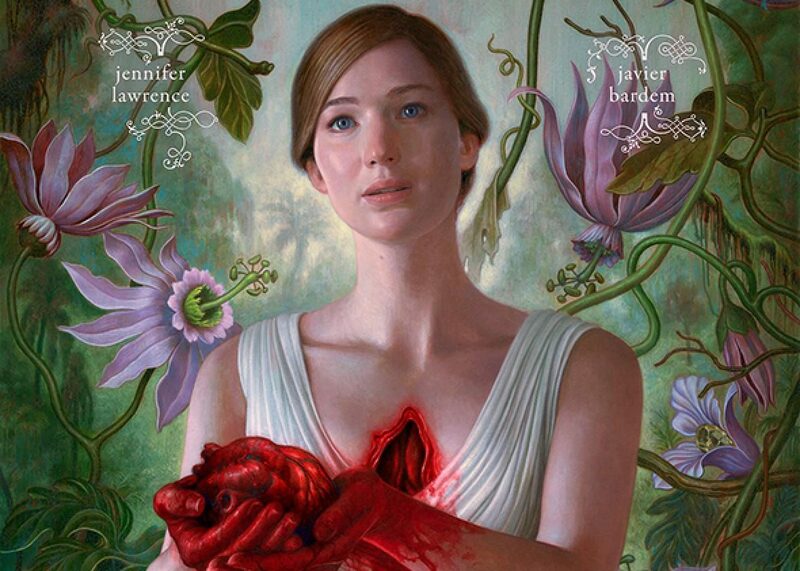 When the teaser poster for mother! was unveiled, it instantly became clear that director Darren Aronofsky had another shocking and surreal experience in store for us. The man behind Requiem for a Dream and Black Swan hasn’t let us down with his latest psychological thriller. This is a movie that more than earns the exclamation point at the end of its title. As far as punctuation goes, mother! is also bound to leave its audience with several question marks swarming in their heads. The most frequently asked question is likely to be, “what was that all about?” The short answer is that this is a fascinating metaphor for pregnancy, parenthood, and the price of fame. As for the long answer, well… let’s just take a look at the plot. For most people, their house is a sanctuary and their body is a temple. For Jennifer Lawrence’s character, simply known as Mother, both her sanctuary and her temple are slowly torn down throughout this film. Lawrence plays the dedicated wife of Javier Bardem’s Him, an acclaimed poet with severe writer’s block. They apparently live in the middle of nowhere without a neighbor in sight. Although Mother is eager to have a baby and complete their dream home, Him seems disinterest in building a life with her. He’d rather surround himself with people that praise his work and inspire him to keep writing. Enter Ed Harris and Michelle Pfeiffer as a couple strangers that drop in. Essentially popping up out of the blue, these strangers immediately make Mother uneasy. Much to his wife’s dismay, Him invites the man and woman to stay with them. It doesn’t stop there. Soon enough, the house Mother has worked so hard to refurbish is packed with strangers that see no problem with making themselves at home. They ask incredibly personal questions, treat the furniture like it’s a jungle gym, and refuse to listen to a word Mother says. This can be interpreted in several different ways. You could ague that the strangers invading Mother’s house represent the symptoms of pregnancy. When you’re suddenly sharing your body with another living creature, it’s easy to feel overcrowded, uncomfortable, and unable to handle all the changes you’re enduring. The strangers could also be symbolic of parenthood. Maintaining a home with nice things can prove futile with hyperactive rugrats running around and getting them to obey orders is often easier said than done. Of course pregnancy and parenthood isn’t quite as scary when you have a supportive loved one in your corner. Sadly, Mother doesn’t have a caring partner in Him. He’s a man that just takes, and takes, and takes until there’s literally nothing left. This brings us to one of the film’s most prominent themes: the price of fame. Where Mother wants nothing more than a quiet life with her husband and a baby, that’ll never be enough for Him. He’d gladly trade his marriage, his child, and his home for an autograph to sign. As far as he’s concerned, a wife can be replaced, but his art will be forever. With her Oscar-winning performance as Mia in Black Swan, Natalie Portman seemingly channeled the main character from Rosemary’s Baby. With mother!, Aronofsky and company have made another film that draws heavily from Roman Polanski’s 1968 classic. Yet, mother! still stands out as an utterly unique outing thanks to its powerhouse performances, gothic imagery, and symbolism that’ll leave you analyzing the story long after the credits roll. While it’s film that’s definitely going to divide audiences, one thing is for certain: there’s a lot to talk about here. This entry was posted in Features and tagged Drama, Horror, Mystery on September 14, 2017 by Nick Spake.